Tamale, in the center of Ghana’s Northern Region, is one of those cities that it’s really easy to fall in love with. At between 250,000 and 500,000 people, it’s just the right size that it’s easy to get to know the feel of the place, and to become very familiar with a couple of neighborhoods, but still feel like there is plenty left to explore. The people here are very kind and polite; even the dominant local language, Dagbani, sounds friendly. Part of the greeting etiquette is the word “N-naa,” which is said as one syllable with a heavy, elongated accent on the “aa” sound. It is impossible to be angry at someone when you say “N-naa” to them. The genial demeanor of the people, the small-town feel the city achieves despite its size, and the fact that is the economic center of the northern half of the country, dealing primarily in agribusiness, make it a popular home base for ex-patriots overwhelmed by the intense, sprawling rush of the national capitol, Accra, on the country’s southern coast, and for international NGOs that deal with more rural populations. Tamale—and the north of Ghana in general—does suffer something of an inferiority complex, though. Accra and Kumasi, Ghana’s two larger cities, and both in the south, are the media centers of the country, and the standards for taste in music, television, and movies come from these cities, especially Accra. Exacerbating this complex is the fact that Accra and Kumasi are distinguished from Tamale both ethnically and religiously. Accra is Ga and Kumasi is Asanti, but the Asanti language of Twi will get you by in both of those cities, while in Tamale here, Dagbani is the predominant language, and unless you travel south for an extended time, it is difficult to pick up Twi. Also, those southern cities are both predominantly Christian while Tamale is about 80% Muslim. For Dagomba musicians and filmmakers, this puts them in a difficult position. If they aspire to reach national or even international audiences, the assumption is they have to move to Accra and start writing songs in Twi or English, leaving their family behind to chase the specter of success. This specter is especially fleeting due to the Ghanaian music industry’s emphasis on hype and projecting an image of fame over arguably more important elements of musical creation—namely performance and musicianship. Most songs are created by studio engineers or producers on programs like Fruity Loops and the singers, while incredibly adept at creating catchy melodies and poignant lyrics, usually cannot play any instruments. The vast majority of Ghanaian concerts are performed in a style called “miming,” which is essentially standing on a stage and holding a microphone that may or may not be on while someone plays a copy of your CD over the loudspeaker. Miming became the performance standard of performance in Ghana for a variety of reasons, which I will likely detail in a later post, but suffice to say what has developed is a musical landscape that is almost entirely devoid of actual musical instruments. While this style is very well received in Ghana, artists who have aspirations of becoming known outside of Ghana or West Africa know that Western audiences will hold them to a different standard of performance. The challenges to making this switch are the rarity of musical instruments and equipment (demand has been low for years, and instruments are now both hard to come by and very expensive when you do find them) and suitable rehearsal space. It is also becoming an increasingly difficult way to make a living: MP3 sharing via Bluetooth connection is very popular here, and piracy is rampant. Musicians have about a two-week window in which to sell their album before profits become negligible. A select few musicians have been able to overcome this by successfully promoting themselves as superstars, forgoing trying to make money off of music in lieu of lucrative product endorsements and personal appearances. Of course, not every musician can be a superstar, and many Ghanaian artists, especially those here in the north, are left at an impasse with no clear way forward. My project, designed in collaboration with Sheriff Ghale, a very well known and well respected reggae artist and music scholar here in the north, is an attempt to provide an alternative to this dilemma. 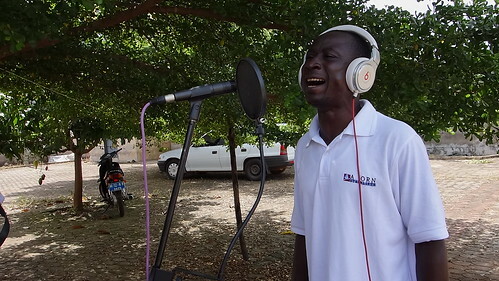 Sakasaka Music is a rehearsal space and a record label, made available to the professional singers and musicians in the Tamale area. The rehearsal space is intended to provide singers here a chance to learn how to play with a band with the hope of creating an active local live music circuit. There is a large local demand for live music: the many expats here complain that there is no music scene, and the few (usually mimed) concerts that are held in town are very well attended by Ghanaians and expats alike. There are also a number of small- and medium-sized venues in town that can and want to have live band music. 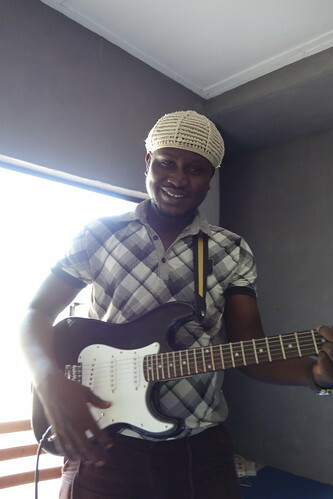 The one working band that I know of in town, a group called the Savannah Echoes led by an old, blind guitarist named Prince Mahama, is constantly busy. The rehearsal space, complete with a (almost) whole band’s worth of instruments and a PA (speakers be built by next week), alleviates the challenges of finding musicians who own their own instruments and a place to play them. I have a group of musicians—most of whom play at church every week—who will be backing the artists Sheriff and I have selected to begin working with. The space is at my residence, a large compound that is the part-time residence of an American-based musician named Mohammed Alidu. Alidu has a studio set up here that he has graciously offered me the use of, and I will be taking advantage of it to do rough recordings of most of the rehearsals that we do here at the house. Artists who take advantage of the Sakasaka Music rehearsal space will also have selections from their back catalog released on Bandcamp pages, and hopefully eventually on iTunes, Amazon, and other large online distributors. Hopefully some of the recordings from rehearsals will also be made available for purchase through Bandcamp. Here is an example of a song played at rehearsal in mid-November. 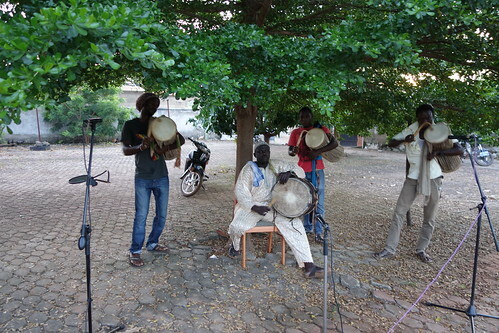 The singer is Abu Sadiq, a very popular artist in the region. The song is called “Azundo,” and it is about a man of that name who leaves his family in the north to pursue a non-existent job in Accra; it is an appropriate theme song for Sakasaka Music. Awesome, Phil! I’m really digging the Azundo track! Looking forward to watching your project grow. hours of peaceful time passed. Next Next post: What Does Hip-Hop Mean to You?